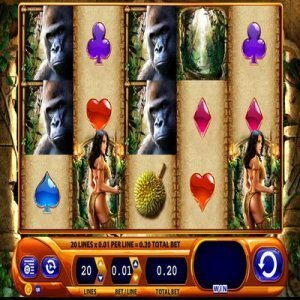 [miau] Another popular slot machine game that is making it’s way from the traditional casinos to the online market, Amazon Queen. This is a WMS Gaming slot machine that develops many thrilling, fun games for the avid gambler or even the beginner. The graphics will have you trapped into the world of the Amazon at first sight. This is a 20 line machine that features many fun symbols one would see in the jungle. Themes are very important in the slot machine world and Amazon Queen makes sure to follow this rule of thumb. The theme is what makes the player remember the specific slot, so when they return to the casino or online they can find it quickly and continue to enjoy playing. The symbols included are gorillas, tigers, parrots, snakes and also card suits lie hearts, diamonds and spades. It also features the famous Amazon Queen symbol. The great thing about this particular slot machine is that it pays both ways, giving you more of a chance to win. The gorillas are also stacked, which means if you receive many of them on consecutive reels, you could be looking at a large payday. This, of course, depends on the bet. The more you bet, the more you will win. This game also features a wild symbol, the Amazon rapids symbol which resembles a waterfall. This symbol appears on reels two, three and four and substitutes for all of the other symbols, including the stacked gorillas. But it does not substitute for the Amazon Queen symbol. The reason many players enjoy these type of machines are for the exciting bonuses. In order to activate a bonus, one must get three Amazon Queen symbols. These symbols can appear anywhere on the screen and can be on any reel. So if you receive two, keep your fingers crossed that the third one is on its way. The machine makes a certain noise every time one of these symbols appears, so you will be well aware if you are on your way to the bonus round. 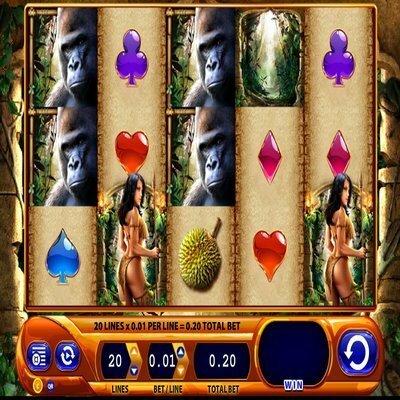 If you hit the minimum three scatter Amazon Queen symbols, you will win ten free spins, four will award you 25 and five scatters will get you 100 free spins. So take your coat off and prepare to stay awhile. It’s also important to note that the bonus can be retriggered within an existing round. This is a fun slot to play and easy to understand for the beginners. The symbols are large and distinct and the bonus round just involves free spins, no additional games to confuse the player. A great machine to look for in any casino whether on land or online.